On Halloween, 1015 Folsom hosted their annual Mad Hatter’s Ball in the SoMA district of San Francisco. The mood was festive and everyone was dressed for the occasion; the club was even decorated as well. 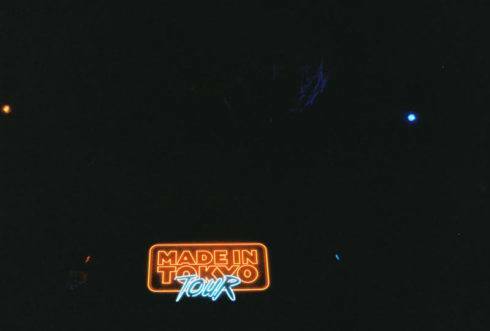 MadeinTYO, one of the headliners that night, did not disappoint. His spooky visuals were a nice complement for the Halloween celebration: He had up the Private Club Records symbol, his record label, in black and white, and his name in a dark red font on top of a black background with a rad car to add aesthetics. Hit after hit, the crowd was hype from start to finish. He took us through the classics from his past several mixtapes. I was glad to hear my personal favorites I Want and Skateboard P. MadeinTYO brought so much energy with him. He was jumping all over the stage. With every song, the crowd was shouting out his lyrics right back. There were obviously true fans in the audience that night (no pun intended—his son’s name is True). He performed in the venue’s main room, which he had packed from the balcony all the way to the back of the ground floor. My only complaint, this full house made for a hot environment–everyone was sweaty from dancing all night long. His 45-minute set went by fast, but it was enjoyable and memorable to say the least. Trippy Turtle came on after him and Bay Area’s own DJ Aux Cord spun in the front room. next post: San Jose’s own @ZiDouble408 Tops Urban Charts with @KrikitBoi produced, “One”.